Pocketknives are something that has always fascinated me. I always carry at least 2 and most of the time three. The three that I carry are an old Spyderco G-2 stainless with a two and a half inch blade. I have been carrying this knife for about twenty years, I use it everyday and it has never let me down. My second knife is a Leatherman Micra . It has been on my key chain since they first came out, probably about ten years or so. The little scissors and the nail file are always handi and I keep the little knife blade razor sharp. These two knives are always with me unless I am flying. My third knife is a Leatherman Wave. Maybe not technically a pocketknife, but close. I have had this about 6 years or so. I use it almost every day. The pliers are extremely useful. If I had to choose only one to go to the field with it would be the Wave. This combination has worked well for me and even though there are lots of new knives coming on the market I will probably stick with these. They have served me well. If you are serious about preparedness a good pocketknife is one of the most useful tools you can have. My wife and all my grandchildren have good pocketknives and carry them as much as possible. Unfortunately, in this state they are not allowed to carry them to school. I often have a good laugh when I watch the expression on people faces when my wife will pull out her knife and open a box or cut something for them. From self-defense to skinning an animal or fixing your lunch, a knife is a tool that can keep you alive. When you go to choose one, there are several things to remember. First, know the laws in your area and find a knife that falls within the law. Second stay away from Chinese or foreign junk. Some foreign knives like the Spyderco are of good quality. Third, make sure the knife meets your needs. Don’t buy something flashy just for looks. Fourth, use the knife and learn how to sharpen it. The more familiar you become with a knife the better it will serve you. What do you Carry in Your Vehicle? This entry was posted in self defense, survival, tools and tagged Howard, Leatherman Micra, Leatherman Wave, Pocketknife, Spyderco. Bookmark the permalink. I agree about the Wave. It’s been my EDC for years, when I wasn’t carrying an old Leatherman Supertool (bigger, heavier). I match mine with a Swiss Army Huntsman and a Buck 110 Folding Hunter, both, constant companions for 30 years. Your setup is a little lighter but I wore a tool belt for years and don’t like clip-on knives. It’s easy to sharpen the other knives with the Wave’s diamond file. Sometimes you have to turn a screw at the same time as you hold the nut and you’re not going to do it with one tool. I have carried a Gerber Multi-Tool since I reported to my first assignment. 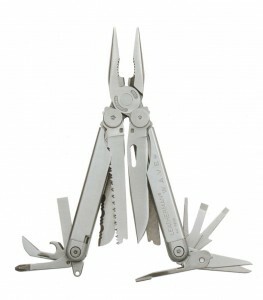 I preferred this over Leatherman because the pliers slides out of the handle and is fixed in place. I have had 2 stolen from me (one by TSA from my duffel bag) and returned 1 to the factory for repairs. The 1 I returned I had seriously abused for 10 years, ultimately breaking off the blade (the saw cuts trees just fine but the blade doesn’t). I used the blade to cut open cans fairly easily, but it does need sharpening after you cut open a few of them. I have used the wire cutter to cut barbed wire (1 strand at a time works best). And opened many an ammo crate and repaired many a vehicle using my Gerber.